N.C. COAST — In the United States, 500 million straws are used every day, according to Plastic Ocean Project. That’s about 182.5 billion pieces per year of non-recyclable, single-use plastic accumulating in oceans and landfills, contributing to the litter problem or harming wildlife. And countless numbers of these straws are found on North Carolina beaches. During the last few years, several conservation and environmental organizations have been trying to eliminate this type of single-use plastic at its source with the Ocean Friendly Establishments initiative. Working together on the Ocean Friendly Establishments campaign to encourage restaurants to only serve plastic straws upon request are the following: Plastic Ocean Project Inc.; Wrightsville Beach Keep It Clean; North Carolina Marine Debris Symposium; Surfrider Foundation’s Cape Fear, Bogue Banks and Outer Banks chapters; North Carolina Aquarium at Jennette’s Pier; University of North Carolina Wilmington Plastic Ocean Project; Crystal Coast and OBX Ocean Friendly Establishments; Ocean Conservancy; Keep Brunswick County Beautiful; Keep New Hanover Beautiful; and Penguin Radio Station 98.3. When restaurants and other businesses become Certified Ocean Friendly Establishments, or OFEs, owners and managers have agreed to only serve straws upon request. Each restaurant or business is presented with a certificate to display its commitment to reduce plastic pollution. The Ocean Friendly Establishments campaign is in line with this year’s Earth Day Network theme to “End Plastic Pollution.” Earth Day 2018, which is April 22, “is dedicated to providing the information and inspiration needed to fundamentally change human attitude and behavior about plastics,” according to the international organization’s website. 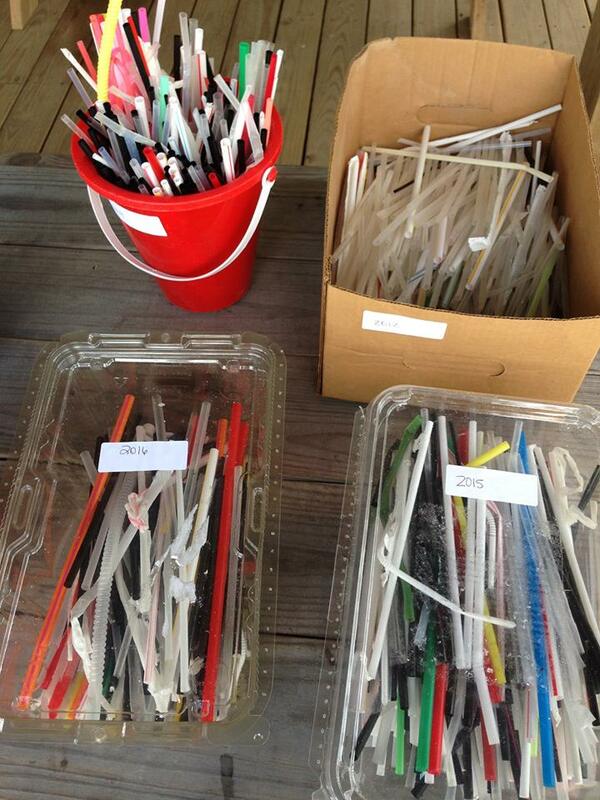 Straws have been a problem for Ginger Taylor, founder of Ocean Friendly Establishments, ever since she started Wrightsville Beach Keep It Clean in 2009. 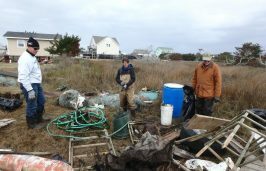 She formed the group to coordinate volunteer cleanups on the beach. Four years of straws collected from the same three-quarter mile stretch of beach in Wrightsville Beach every Monday morning from May 15-Aug 31. In 2017, there were 100 fewer straws than last year and the least amount of straws from any previous year. There are two Ocean Friendly Establishments in that stretch. OFE Facebook. That sparked the idea to begin a campaign to approach businesses about reducing the number of straws used. She mentioned the idea to Bonnie Monteleone, founder of Plastic Ocean Project, who expressed her interest in helping with the campaign that is known today as Ocean Friendly Establishments. Plastic Ocean Project Inc. is a nonprofit organization working to address the global plastic pollution problem. 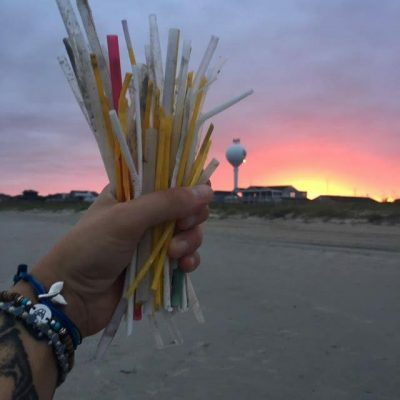 During the September 2014 North Carolina Marine Debris Symposium in Sneads Ferry, Bill Baggett of the Blockade Runner Beach Resort agreed to no longer serve straws unless requested at the resort, Taylor said. 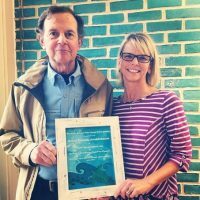 Through 2015, progress was slow on getting more participating businesses but Taylor, Monteleone and Taylor’s friend Kim Beller were able to move forward with and establish the campaign, which she presented at the 2015 state Marine Debris Symposium to a receptive audience. Today, certified Ocean Friendly Establishments can be found along the entire North Carolina coast. Taylor told Coastal Review Online that the program has expanded to include sister campaigns, OBX Ocean Friendly Establishments in the Outer Banks and Crystal Coast Ocean Friendly Establishments that covers from about Swansboro to Cedar Island. 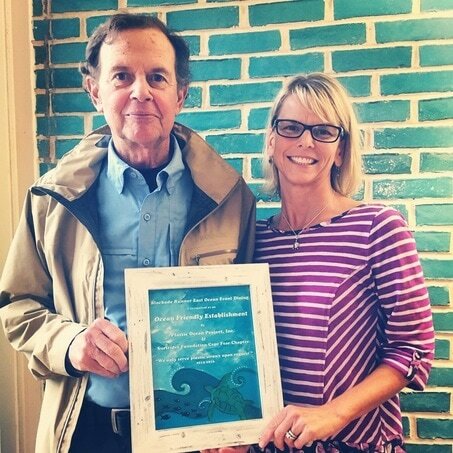 Crystal Coast OFE lead volunteer Jessica Holleman, who owns her own acupuncture business in Morehead City, became involved in the program after coming across the Cape Fear OFE’s social media posts about some of her favorite restaurants in Wilmington being Ocean Friendly Establishments. Holleman said the Crystal Coast chapter is working to have as many establishments as possible from Swansboro to Cedar Island reduce straw use by becoming certified Ocean Friendly Establishments. There are currently more than a dozen in the area and many of the certified establishments go above and beyond by offering biodegradable to-go containers and to-go cups as well, she said. To help spread the word, Holleman said anyone who goes to a restaurant can volunteer just by placing information printed on paper the size of a business card explaining the goals of OFE in the bill when they leave. Cards can be picked up at the Coastal Community Market, 606 Broad St., Beaufort, and Crystal Coast Waterkeeper office, 700 Arendell St., Morehead City. 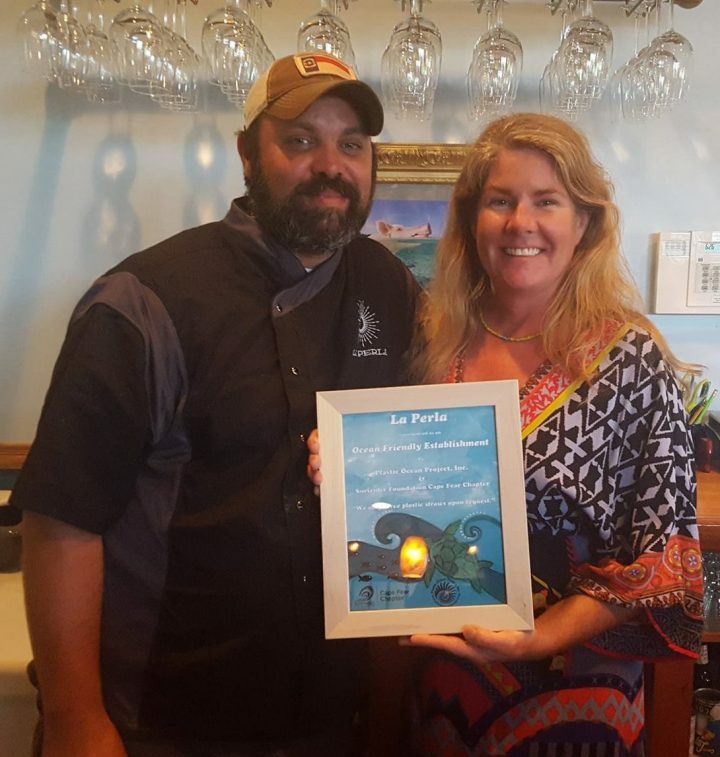 Jessica Murphy, owner of La Perla restaurant, said she and Chef Kevin Davis are very committed to the Ocean Friendly Establishments program. Murphy added that La Perla only serves sustainable seafood, as well. New to the Ocean Friendly Establishments program is the Outer Banks initiative. Nearly 20 establishments from Corolla to Nags Head have joined in the past month. Sam Burdick, Plastic Ocean Project ambassador, said the Outer Banks Brewing Station was the first to be certified. An Outer Banks native, Burdick is a graduate student at Duke Marine Lab in Beaufort studying coastal environmental management and a researcher at the North Carolina Coastal Reserve & National Estuarine Research Reserve. She’s also an outreach coordinator for the Duke Community Science Initiative, and a global ambassador for the Plastic Ocean Project. Burdick added that she thinks it’s important to note that this is really an incentive program to get businesses to reduce their consumption of single-use plastics. “In exchange for their pledge to limit the use of straws or avoid plastic bags, or both, we provide a framed certificate for display and promote their business on our social media pages and websites. It’s really a win-win,” she said. Applications to become an Ocean Friendly Establishment are available on the organization’s website as well as the list of participating restaurants.